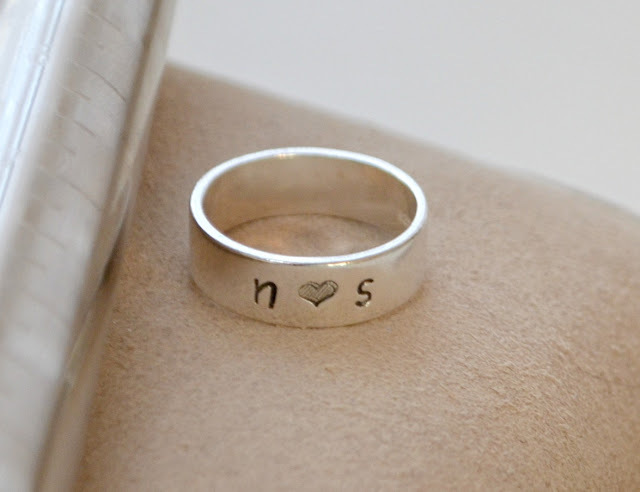 Amy Latta of One Artsy Mama provides a step-by-step tutorial on how to stamp on metal rings. 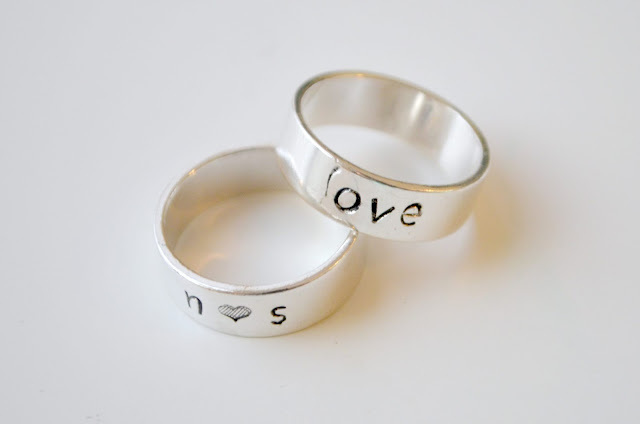 She personalized a couple of simple and super cute wide band rings. Over the past few years, metal stamping has become one of my favorite ways to create jewelry. Ever since I got my first set of stamps and realized how easy it is to do, I’ve loved being able to make pieces that are completely personalized, both for myself and as gifts for others. 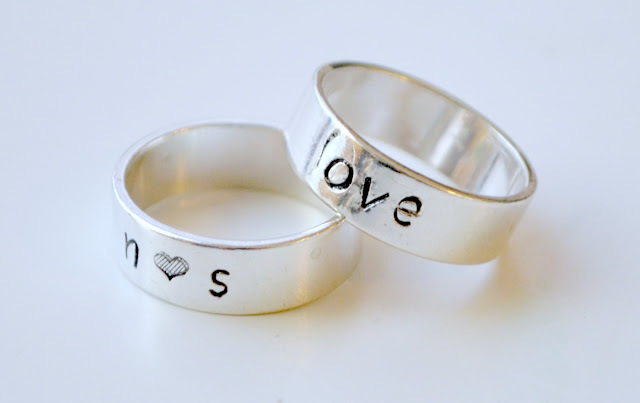 I’ve made and shared tutorials for all kinds of stamped necklaces, bracelets, earrings, and keychains, but the one thing I wanted to do and couldn’t was create stamped rings. 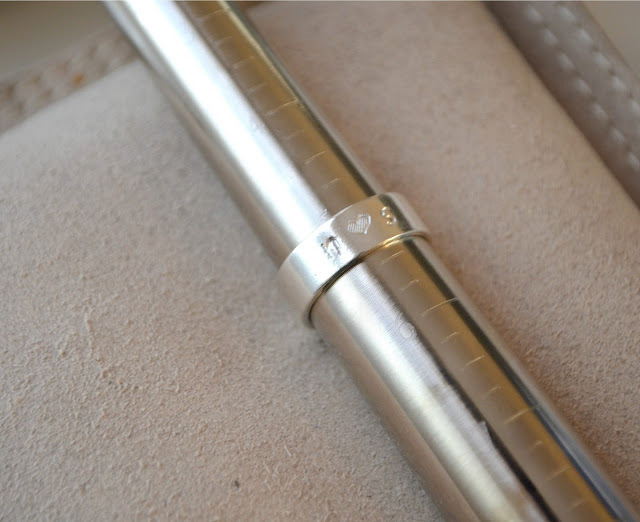 I did attempt it, using aluminum blanks you stamp first and then bend into shape, but we all know that adjustable rings aren’t the most comfortable things in the world. The blanks were very short, too, so the ends didn’t even close around my fingers. I finally decided to do a little research on what I would need and get the right tools to stamp on non-adjustable rings that were already shaped. 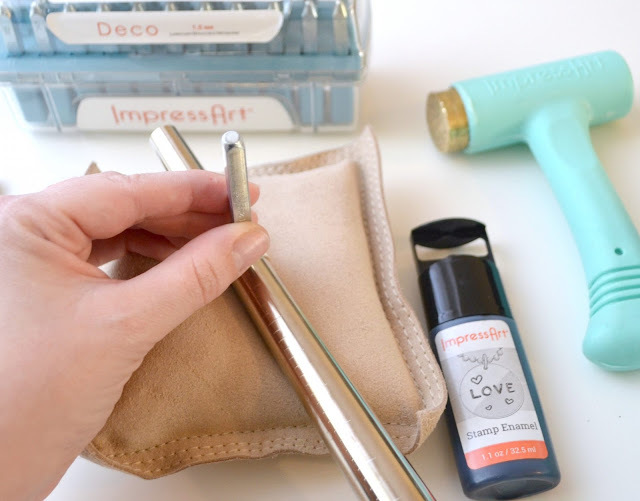 Here’s what I discovered and how I stamped my own! 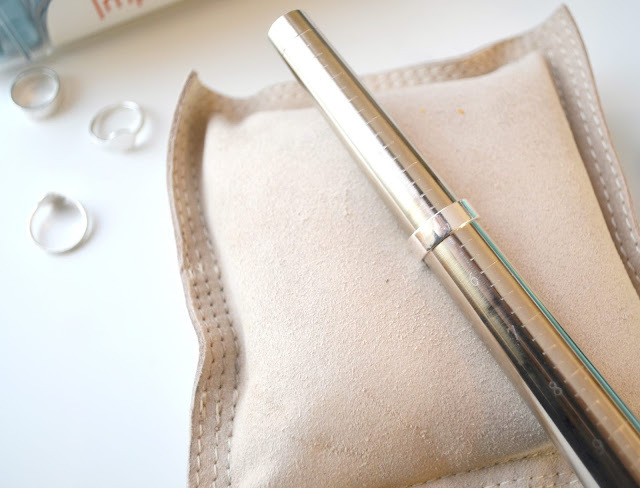 Step 1: Place your ring snugly on the mandrel. Push it down as far as it will go so that it doesn’t move. Step 2: Nestle the mandrel into your sandbag. 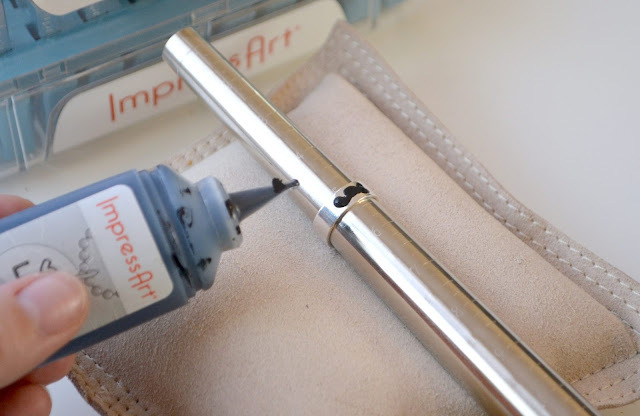 Another option is to use a table vise to hold the mandrel still while you stamp. Step 3: Stamp your words, letters, or images as normal, turning the mandrel as you go. If you’re new to stamping, you might not want to make this your first project; try a few practice blanks on a flat surface first just to get a feel for it. Hold your stamp vertically with the image/letter touching the blank. Give a very firm tap on the top of the stamp with your hammer. One good solid tap should be enough to create a clean image. Tapping too many times may cause your mandrel to shift slightly and give you a messy or double impression. As far as what you stamp goes, the sky’s the limit. You can write a word, a name, a phrase, or anything meaningful to you. Here I used two initials with a little lined heart stamp in between. Step 4: Cover the stamped area with stamp enamel. Fill it in completely, then wait 10-30 seconds for it to dry. Use a soft cloth or a paper towel to wipe the surface and remove the excess enamel. Everything on the top should come off easily, while the enamel down in the grooves of the stamped areas will remain. That’s it! 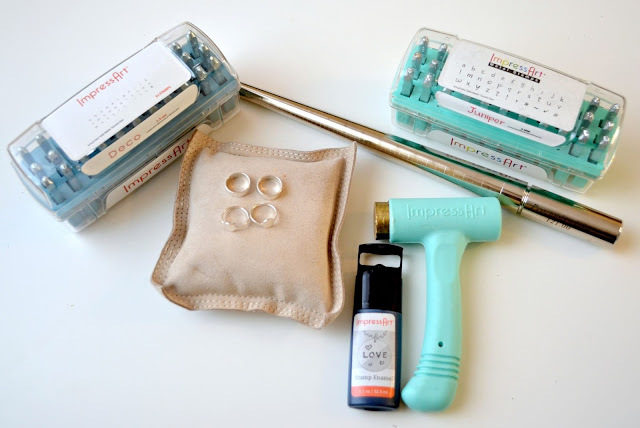 You can remove your ring from the mandrel and wear it or give it away! There are a variety of ring shapes and sizes available at Beaducation, including these Wide Bands, Thin Sterling Silver Bands, and bands with heart, circle, and rectangle shapes. I love how these turned out, so now I am anxious to give some of the other styles a try! What do you think? Which styles would you most like to stamp and wear? I’d love to hear what you think and see your own stamping projects! Be sure to join us on Facebook in the One Artsy Mama & Friends group and share your latest creations. 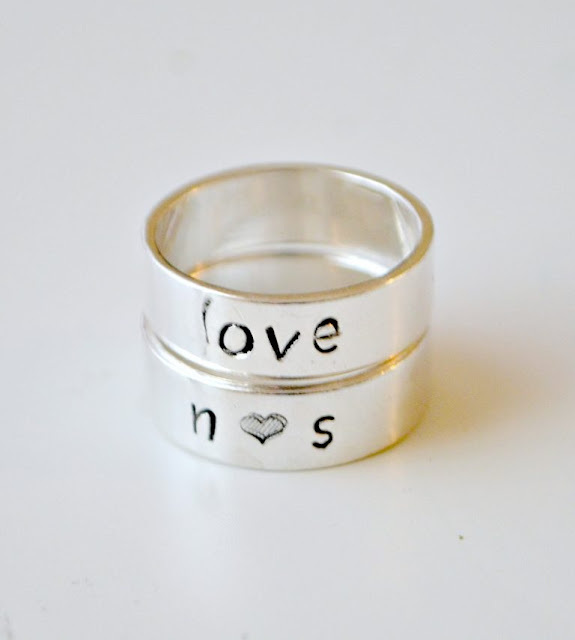 Thank you Amy Latta at One Artsy Mama for a great step-by-step tutorial on stamping on rings. Customized diamond rings for women are all time love for me and this is the pattern I saw first time that how it is designed. I loved it.